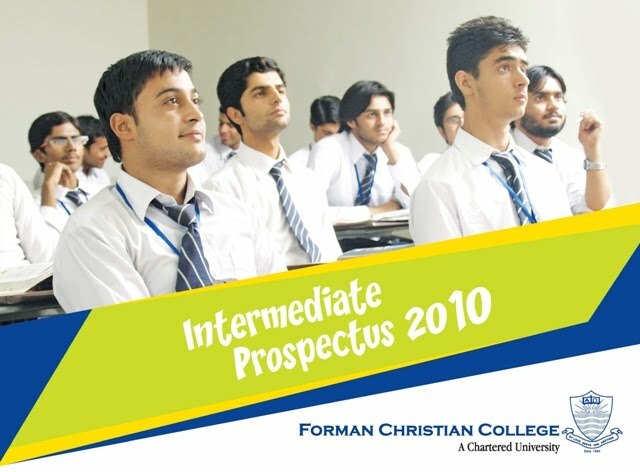 Forman Christian College has announced schedule for admission in it Intermediate program. Matric result is expected to announced at August 04, 2010 so FCC has announced its schedule for its most famous program i.e. intermediate. 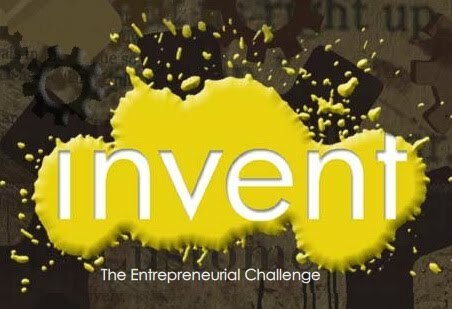 O Level students can also apply for this program but only in Pre Engineering and Pre Medical programs. Admission schedule is given below. For those students who want to get admission on sports basis, the physical fitness tests and trials schedules is given in this link. Finally University of Central Punjab has announced its admissions Fall 2010 in almost every discipline they offer. The complete list of programs they are offering is given below. BBA Honors - 4 years program for F.A/F.Sc/I.Com/A.Level or equivalent degree holders. BS Honors Economics - 4 years program for F.A/F.Sc/I.Com/A.Level or equivalent degree holders. MBA - 3 years program for B.A/B.Sc/B.Com or equivalent degree holders. MBA - 1.5 years program for BBA (Hons) or equivalent degree holders. MBA Banking & Finance - 3 years program B.A/B.Sc/B.Com or equivalent degree holders. MBA Executive - 2 years program B.A/B.Sc/B.Com or equivalent degree holders with minimum of 2 years experience. MS Management Sciences - 2 years program for BBA/MBA/MPA or equivalent degree holders. PhD Management Sciences - At least 18 years of education required. B.Com Honors - 4 years program for F.A/F.Sc/I.Com or equivalent degree holders. BS Honors Applied Accounting - 4 years program for F.A/F.Sc/I.Com or equivalent degree holders. M.Com - 2 years program for B.Com(IT) degree holders. MS Commerce - 2 years program for B.Com(Hons)/M.Com/MBA degree holders. M.Phil Commerce - 2 years program for B.Com(Hons)/M.Com/MBA degree holders. PhD Commerce - At least 18 years of education required in same field. BS Computer Science - 4 years program for F.Sc/ICS or equivalent degree holders. MCS - 2 years program for BA/B.Sc or equivalent degree holders. MS Computer Science - 2 years program for BS or Equivalent degree holders. PhD Computer Science - for MS and equivalent degree holders. BS Electrical Engineering - 4 years program for F.Sc Pre Engineering students. MA Islamic Studies - 2 years program for BA/B.Sc/B.Com/Wafaq Al-Madaris approved degree of equivalent degree holders. MS Islamic Studies - 1 year program for MA or equivalent degree holders in same field. How to Apply: You can submit your application forms online or by visiting their campus at 1- Khayaban-e-Jinnah, M.A Johar Town Lahore. Download application forms from here. There is going to be an International Education Expo in Lahore, Karachi and Islamabad. This expo is for those students who wish to study abroad, specially in Australia. 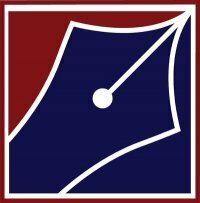 HR Consultants Pvt. Ltd is organizing this event. Details are given in their advertisement given below. The first prize is associated with a treasure of Rs. 500,000 while the second prize was tagged at Rs. 300,000. Third positioned teams gets 250,000. Each comes with certificates for students and a plaque for the participating institution. MCAT 2010 was held on 20th July across Punjab in which a total of 31602 candidates appeared for 3361 seats. 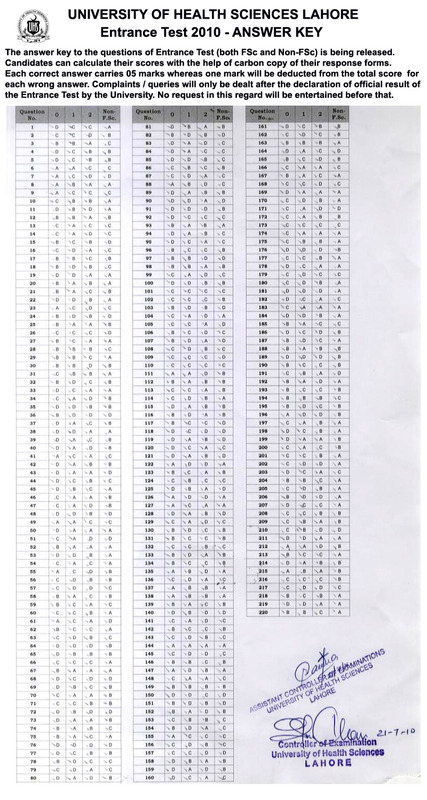 This total of 31602 candidates consists of 10816 male students and 20786 female students. University of Health Sciences has announced that the result of MCAT 2010 will be published on the website today. Meanwhile go see the University of Health Sciences website for any updates. 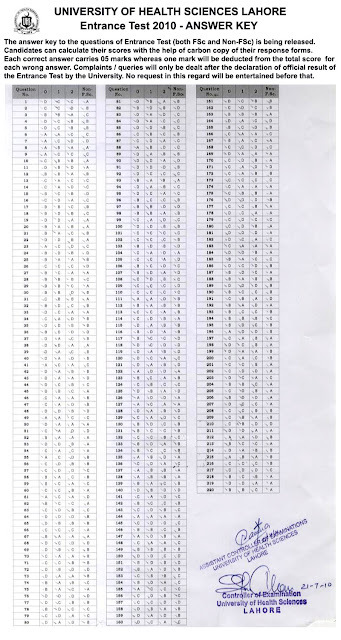 RESULT KEY: Click on the image below and zoom to match your answers with this correct answer key for MCAT 2010. Click here to see University of Health Sciences official website result key page. Institute of Business & Technology has announced its admissions fall 2010 in following programs. BIZTEK is chartered by Govt. 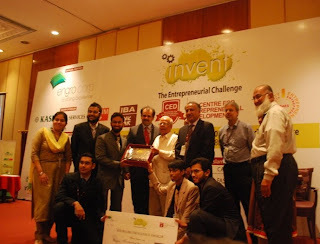 of Sindh and is placed in W category of HEC. MBA - Marketing & Advertisment, Banking & Finance, Supply Chain & Retail Management, Media & Telecom, HRM, CRM, Insurance & Financial Services. Admission Kit can be obtained from all campuses on payment of Rs. 1000 only. 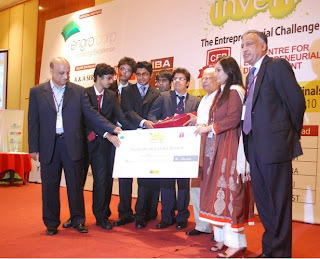 You can also apply online at www.biztek.edu.pk. Last date to apply is August 05, 2010. Hailey College of Banking & Finance know as Old Hailey has announced the schedule of entry tests for admission fall 2010 in its MBA morning program in Banking & Finance and Insurance & Risk Management. Entry Test applications on prescribed form are invited for admission to the MBA morning programs from the candidates who have obtained Graduation (14 years) or equivalent or awaiting results. Prescribed Entry Test Forms are available from admission office of the college from July 12, 2010 onward. Last date for submission of Entry Test Form is July 22, 2010. Entry test will be conducted by the College at Punjab University Examination Center, Wahdat Road, Lahore on Friday 30 July, 2010. Result will be declared on August 08, 2010 and will be available on college's website and notice board. First Annual Examination 2010 & Second Annual Examination 2009. First and Second Annual Examination 2008. PSEB is looking for Business Development Manager (Islamabad) and Marketing Officer (Islamabad) for more information please visit http://jobs.pseb.org.pk and apply online. Pulcra Chemicals is looking for Assistant Marketing Manager. Ideal candidate should have a MBA degree with marketing specialization. Send your resume, cover letter and photograph at the following address. Institute of Space Technology (IST) Islamabad has announced its admission in Bachelor's degree programs. IST is offering programs in following disciplines. SSC/ O-Level with minimum of 60% marks. HSSC/ A-Level with minimum of 60% marks. NAT-1E/NAT-1CS with at least 50% marks. Limited seats are also available for DAE students. Prospectuses will be available from July 20, 2010. Last date to apply is August 23, 2010. Classes will commence from October 4, 2010. You can have more information on IST's official website or ask me if you want to. Admission hand books are available at the following branches of Askari Bank, Lahore. Shahrah-e-Tijarat Branch, Allama Iqbal Town Branch, DHA - Z block Branch and Model Town Branch. Take the application forms from any of these branches of Askari Bank and deposit the filled forms before July 24, 2010 between 09:00 am and 02:00 pm. For more information you can visit college website also read our review on Kinnaird College here before you apply for KC. The University of Punjab has announced that there will be university's own entry test for some departments for admission in B.A/B.Sc programs for the year 2010-2013. Following are the departments that will take this pre-admission entry tests. Microbiology & Molecular Genetics, Punjab University College of Information Technology, Clinical Psychology, College of Banking and Finance, Plant Pathology, Administrative Sciences. The entry test forms will be available from respective departments from July 19, 2010. Last date to apply for admission tests is August 02, 2010. Result of these tests will be announced on Thursday, August 12, 2010. University has made it mandatory for all the reserve seat that they will have to clear admission tests to get admission in reserve seats. P.S: This test is a pre-admission test and the further schedule for admission will be announced after Intermediate result. SNL Financial is a leading financial information and research firm. SNL depends upon the teamwork, effort, commitment and intelligence of our more than 1,300 employees worldwide. Currently SNL Financial has vacancies for Financial Analyst and Research Analyst. Below are some details about these positions. Qualification: The ideal candidates should have a MBA or BBA degree from a recognized institution. How to Apply: Send you resumes with photographs to opportunities@snl.com. Please mention position applied for in the subject. Bachelors degree, BBA/B.Com with minimum 2nd division. Merit will be determined on the basis of previous academic record, NDU entry test and interview. M.A/M.Sc or equivalent with minimum 2nd division. Prospectus and Application forms can be obtained for Rs.700 from NDU Registration office or you can download from www.ndu.edu.pk. There are separate charges for GAT entry test. For more information you can visit the website given above or feel free to ask me. Bahria University Medical & Dental college has announced admission in 1st year of its MBBS program for session 2010. Bahria University's Medical college is recognized by PM&DC and its approved by Ministry of Health, Govt of Pakistan. 60% marks in F.Sc with pre-medical subjects. Students awaiting result can also apply by showing hope certificate from their institution that they will get 60% marks in inter. College entry test is essential for all candidate except the foreign candidate who can apply on the basis of SAT-II in Biology, Chemistry & Physics with at least 550 marks. Foreign candidates must submit equivalence certificate issued by IBCC. How to Apply: You can get prospectus and application forms from College Admission office Karachi & Islamabad by submitting Rs.2000. And then submit the filled form before August 17, 2010. Last date to apply: August 27, 2010. For more details feel free to ask me or visit their website www.bahria.edu.pk. On Sunday 11th July, 2010 entrance test for MBA program held in Lahore School of Economics in the Barki Road campus. Their campus is very far away from the city which must have been a problem for those coming from different parts of the city, because there is no route of local transport towards that area. But the good thing was that they were very punctual, test started exact on time which was 9 a.m. As we all know that unfortunately we are not safe from terrorism, to prevent any such thing, the security arrangements were very good and students can feel safe while they are inside the campus. Other arrangements were also very good, like they had already displayed the auditorium’s number on the boards to help students to know their rooms and their employees were also there to guide them towards classes. Test itself was a bit lengthy as at this age most of the students are not used to of 3 hours tests, which would have been a concern for many. But test in comparison with other universities was quite easy, as it didn’t had a lot of in depth mathematics questions and the English portion was also not of a high standard , which I feel was a good thing in students perspective. Again the test was very lengthy and it was a bit hectic to sit there for 3 hours. Mathematics section had 50 questions, sentence correction was 10 in number, comprehension had 30 questions in total and students had to right an essay from 3 given topics. Today on July 12, 2010, entrance test for MS, MBA, BBA, etc held in national university fast. The tests were held on three different timings, the test that held in afternoon was supposed to start at 3 p.m. and the reporting time was given 2:30 p.m. but due to poor management it couldn't start at the right time. They don’t even facilitate their visiting students with car parking. There was not a very foolproof arrangements of security. The test was delayed by almost 30 minutes. Test was computer based. There were four sections of the test, English, I.Q, Quantitative and General Knowledge. Each section had different number of questions and time was also different for every section . The test was very difficult, keeping in view that the students coming for the test are from different fields of study, their main focus was on use of English, as almost every question had one or two English words whose meaning must not be known to the majority. The priority should have been to test the students, whereas their emphasis was more on testing the English of students. 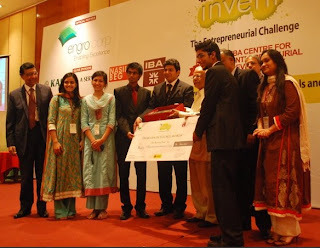 Allover this test was a difficult one in comparison with the Lahore school of economics test. UVAS has announced admissions in its MBA program. This MBA is have a distinguish from other MBA programs is that because this program is designed in Animal & Veterinary sciences. Details of the program are as follows. Program Details: This program of MBA in Life Sciences consists of six semesters with each semester is of 16 weeks including one week of final exams. There are 92 credit hours in this MBA program, having 18 courses each of 3 credit hours, 8 courses with 4 credit hours and one Management Research Project of 6 credit hours. This MBA in Life Sciences offers specialization in following tracks. How to Apply: Prospectus and Application forms can be bought from University of Veterinary & Animal Studies Lahore. Get the forms and submit it after filling before August 02, 2010. For any further information please feel free to ask anything in comments or ask me in Consultancy if you need any guidance on choosing this program to chose this program or not. The MASE is a one year program offered to students with al least BSc Honors in Economics or a degree equal to 16 years of education. The emphasis in on developing students who can think critically and solve problems regarding the market the will eventually work in. This program is designed for students who want to further excel in the field of Economics. A lot of research work will be done by the students during this program. How to Apply: Application forms can be obtained from the Accounts Office on Campus in the Ahmad Saeed Administration Building. For further details you can visit FCCU website by clicking here or feel free to ask me in comments. Preston University has announced admissions fall 2010. University is offering admissions in following programs in its all campuses. How to Apply: You can obtain application forms from any of the university campuses and then submit the filled application forms. For any further information you can visit the website by clicking here. Please note these job opportunities for fresh graduates in different organizations. Follow the instructions and apply only if you fulfill the requirements. Govt of Punjab has took yet another step to promote youth's practical contribution towards the development of Pakistan. After the successful starting of "Chief Minister's Youth Commission" Punjab Govt. has started a new scheme in which Govt's land will be given on lease to Agricultural, Veterinary and Forestry students. What is this Scheme: In this scheme Govt. of Punjab will lease its agricultural land to students of Agricultural, Veterinary and Forestry. Lands will be given on specified lease period which could be extended on performance basis. Students will use those lands to grow forests, dairy farms and do cultivation of different crops. There will be loans for graduates to use the lands properly. Lands will be distributed in different stages, in first stage there will be 30,000 acres of land which will distributes among Forestry graduates on which they will grow forests. In second stage, 50,000 acres of land will be distributed among Agricultural graduates. Eligibility: There is very simple eligibility criteria to apply in this program, you have to be the local graduate of that area in which the Govt. land is available. I think this is a very good criteria as this will encourage locals to study these degrees and also generated some good business in rural areas. Where is the Program Now: Currently Govt of Punjab has distributed lands and loans among 1300 graduates. Certificates will be distributed among those 1300 students by Chief Minister Mian Shahbaz Sharif on July 10, 2010 in Raheem Yar Khan. Govt is also accepting applications for the 2nd stage of this program in which 50,000 acres of land will be distributed among agricultural students. The University of Punjab Lahore has announced that there will be admission tests for two years M.A/M.Sc programs in various departments. Departments: Entry test will be conducted for admissions in following department. Microbiology & Molecular Genetics, Computational Physics (CHEP), Punjab University College of Information Technology, Earth & Environment Sciences, Statistical & Actuarial Sciences, Biochemistry & Biotechnology, College of Banking and Finance, Applied Psychology, Social and Cultural Studies, English, Integrated Mountain Research, Quality & Performance Management, Sports Sciences/Physical Education. How to Apply: The entry test forms will be available from respective departments from July 12, 2010. Last date to apply for admission tests is July 22, 2010. University has also announced that there will be no separate test for evening programs, so those who are interested in evening programs shall appear in the same test.